If you like the sharp style and aggressive exterior, you’ll love the interior. 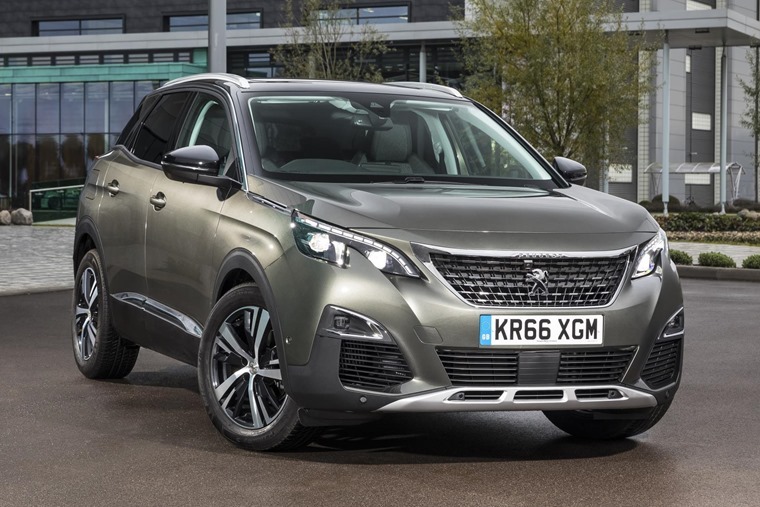 Unlike any recent Peugeot, the new 3008 is an excellent SUV option in an ever expanding market. The people carrier is a dying breed, with the family vehicle of choice now being the high-riding SUV. This pleases car manufacturers as they’re able to charge higher prices for products that are much the same but ride a little higher. 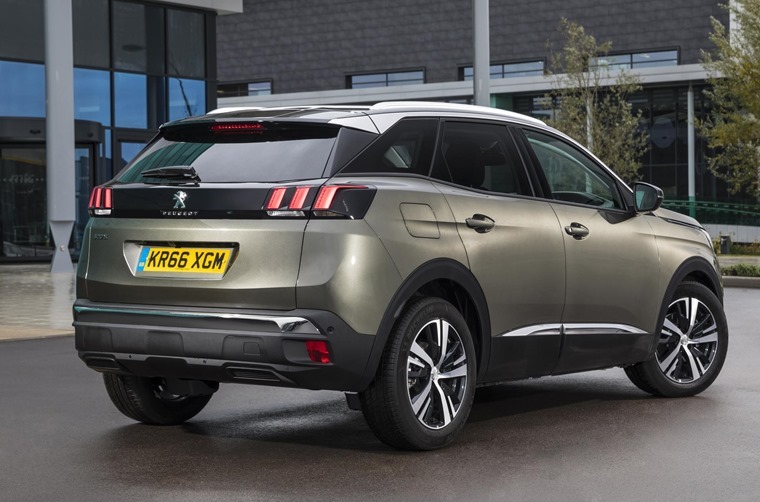 Latest to eschew the box-on-wheels family transport is Peugeot, with the French firm replacing the 3008 MPV with the new 3008 SUV. Gone is the slightly dumpy design, as well as the useful split tailgate - the latter lost in the battle to save weight. In comes a sharp style that’s unlike any recent Peugeot, with strong lines and a muscular stance. It looks every bit the rough and tough 4x4, but all will be sold as front-wheel drive models - there is no all-wheel-drive option - reflecting the market that wants the space and appearance but doesn’t care about off-road ability beyond a damp grass field at the village fete. If you like the aggressive exterior, you’ll love the interior. 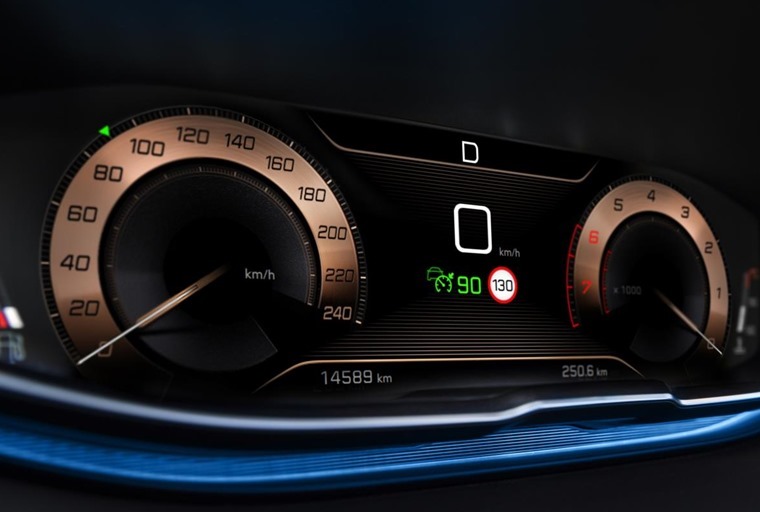 The dashboard looks like it’s come straight from a motor show concept car, with a mix of materials including cloths, carbon fibre and aluminium. It’s as modern as you get, and makes the interior of the likes of the new SEAT Ateca and Nissan’s dominant Qashqai simply appear old fashioned and low rent. There’s a tiny steering wheel that sits below a high-level instrument binnacle, but it’s one that borrows heavily from Audi’s Virtual Cockpit. Instead of having traditional dials, there’s a 12-inch display that changes what appears in front of you depending on driving modes and operation. For example, you could have bold sat-nav instructions one day, a bold rev counter for those days where you wish to make swift progress, or even replicate traditional dials if you’re just pootling around the countryside. There’s also a large touchscreen infotainment system sitting in the centre of the dashboard to work most functions, including the Apple CarPlay and Android Auto connectivity, as well as Bluetooth, DAB radio, climate control settings, and virtually anything else you can think of. There’s certainly no shortage of standard equipment. Fortunately, rather than relying purely on the touchscreen, there are physical buttons below the screen that allow for quick access to frequently used functions, and even they’re designed with style in mind as much as functionality. In fact, it’s not only the best interior in its class, but one of the best full stop. Slightly larger than the Qashqai, the 3008 has more space inside for both passengers and luggage, although the high window line and small glass area makes it feel a lot more claustrophobic for those in the rear. 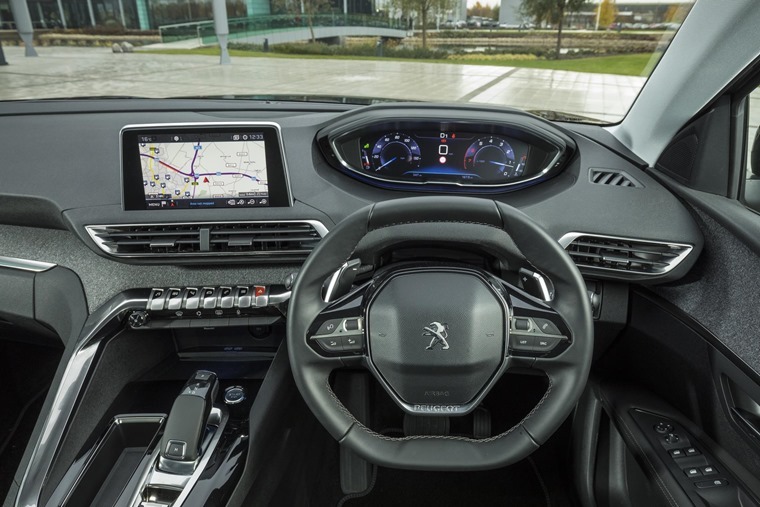 From the front seat you’ll enjoy driving an SUV that thinks it’s a car - the 3008 feels lively on the road, darting from corner to corner, aided by a direct steering sensation that comes through that tiny steering wheel. Bumps are smoothed capably, and there’s little body roll in corners. 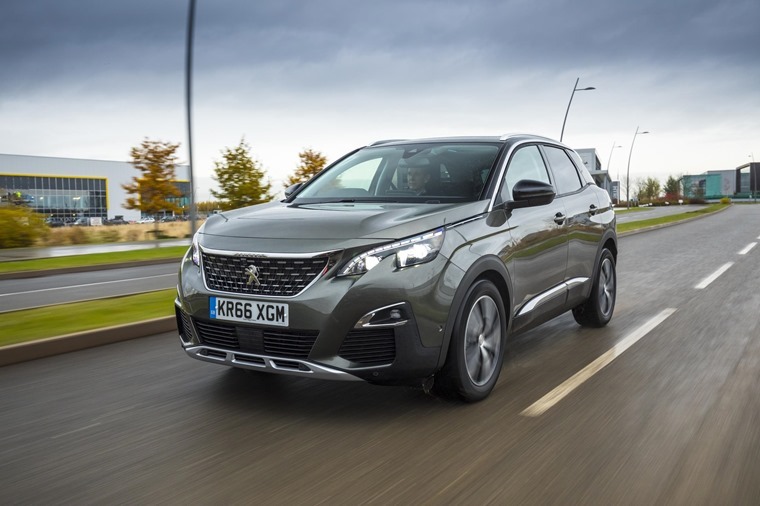 While most buyers won’t be bothered about the lack of four-wheel drive, those that do occasionally venture away from the tarmac will find the standard 3008 getting stuck very quickly. However, the option of Grip Control on some models will make up for some of the lack of Land Rover-esque ability. More than just traction control, it comes with 16-inch wheels fitted with Mud and Snow tyres that combine with some tricky electronics to keep you moving through all but the toughest of terrain, and will certainly get the car further through the tricky stuff than most other cars can manage. For now there are two petrol and two diesel engines, including a tiny 1.2-litre unit that produces 130hp - it’s faster, smoother and more economical than you might imagine. Popular will be the 1.6-litre diesel with 120hp, offering a near-perfect blend of performance and economy. That means 0-62mph will be covered in 11.2 seconds, while Peugeot promises the car will return 70.6mpg - take that with a pinch of salt, but it’s sure to be more economical than you might expect. It all adds up to being an excellent option in the burgeoning market for small SUVs. The Peugeot isn’t perfect - the infotainment system is frustratingly slow at times, it’s not the most affordable on the market, and there’s no real off-road option - but it gets closer to the peak than anything else currently available. If this is what’s replacing the frumpy people carriers of old, then bring it on.